For courses in Transition to Advanced Mathematics or Introduction to Proof. 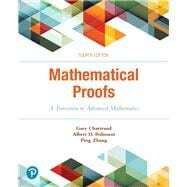 Mathematical Proofs: A Transition to Advanced Mathematics, 4th Edition introduces students to proof techniques, analyzing proofs, and writing proofs of their own that are not only mathematically correct but clearly written. Written in a student-friendly manner, it provides a solid introduction to such topics as relations, functions, and cardinalities of sets, as well as optional excursions into fields such as number theory, combinatorics, and calculus. The exercises receive consistent praise from users for their thoughtfulness and creativity. They help students progress from understanding and analyzing proofs and techniques to producing well-constructed proofs independently. This book is also an excellent reference for students to use in future courses when writing or reading proofs. Gary Chartrand is Professor Emeritus of Mathematics at Western Michigan University. He received his Ph.D. in mathematics from Michigan State University. His research is in the area of graph theory. Professor Chartrand has authored or co-authored more than 275 research papers and a number of textbooks in discrete mathematics and graph theory as well as the textbook on mathematical proofs. He has given over 100 lectures at regional, national and international conferences and has been a co-director of many conferences. He has supervised 22 doctoral students and numerous undergraduate research projects and has taught a wide range of subjects in undergraduate and graduate mathematics. He is the recipient of the University Distinguished Faculty Scholar Award and the Alumni Association Teaching Award from Western Michigan University and the Distinguished Faculty Award from the State of Michigan. He was the first managing editor of the Journal of Graph Theory. He is a member of the Institute of Combinatorics and Its Applications, the American Mathematical Society, the Mathematical Association of America and the editorial boards of the Journal of Graph Theory and Discrete Mathematics. Albert D. Polimeni is an Emeritus Professor of Mathematics at the State University of New York at Fredonia. He received his Ph.D. degree in mathematics from Michigan State University. During his tenure at Fredonia he taught a full range of undergraduate courses in mathematics and graduate mathematics. In addition to the textbook on mathematical proofs, he co-authored a textbook in discrete mathematics. His research interests are in the area of finite group theory and graph theory, having published several papers in both areas. He has given addresses in mathematics to regional, national and international conferences. He served as chairperson of the Department of Mathematics for nine years. Ping Zhang is Professor of Mathematics at Western Michigan University. She received her Ph.D. in mathematics from Michigan State University. Her research is in the area of graph theory and algebraic combinatorics. Professor Zhang has authored or co-authored more than 200 research papers and four textbooks in discrete mathematics and graph theory as well as the textbook on mathematical proofs. She serves as an editor for a series of books on special topics in mathematics. She has supervised 7 doctoral students and has taught a wide variety of undergraduate and graduate mathematics courses including courses on introduction to research. She has given over 60 lectures at regional, national and international conferences. She is a council member of the Institute of Combinatorics and Its Applications and a member of the American Mathematical Society and the Association of Women in Mathematics.